Does endpoint management extend all the way to management of your mobile devices, like smartphones and tablets? It makes sense for IT administrators to think of mobile devices as simply another category of endpoints. Just like the traditional endpoints of PCs, printers and network devices, mobile devices carry data, they are vulnerable, and employees depend on them to accomplish their tasks. Yet while most organizations have well-developed strategies for endpoint management, many have not yet taken the logical step of moving mobile devices into that fold. The evolution of UEM and the most useful characteristics in a UEM product. 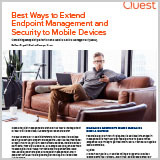 Ideas on unifying endpoint management for all devices in their organizations. – Reduce IT administration complexity, safeguard your network and reclaim lost time. IT departments in growing educational organizations face challenges as new devices, new systems and increased dangers are added to their networks.